More than three years ago, in November 2012, Russell Matthes — whose mother, Elise, founded Sarasota in Defense of Animals — stood before the Sarasota County Commission to make the case for an ordinance banning pet sales at retail stores. After two earlier public hearings on the issue — during which the Commission Chambers was packed — the board will take up the matter again next week. On Wednesday, Jan. 27, the only business item on the agenda is a public hearing on the latest draft of such an ordinance. 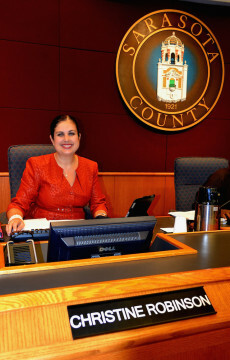 The session will begin at 9 a.m. at the County Administration Center, located at 1660 Ringling Blvd. in downtown Sarasota. “It’s the final stretch for us,” Matthes told The Sarasota News Leader in a Jan. 18 telephone interview. Sarasota in Defense of Animals and a Facebook page, Shut down Petland in Sarasota, FL, both have been marshaling forces in support of the new law. 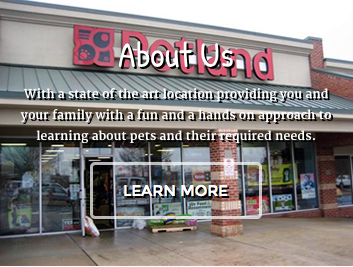 Petland Sarasota’s store is shown on its website. During the last public hearing regarding a proposed ordinance on a ban — held Sept. 21, 2015 — 55 people appeared before the board to offer comments. About one-third of them were representatives or employees of Petland. 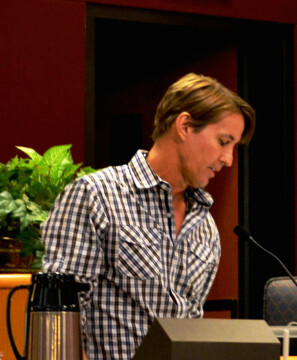 Numerous speakers on Sept. 21 talked of cruelty to animals in “puppy mill” operations. Several showed the board photos of animals in abusive situations while serving as breeding stock for pet stores. 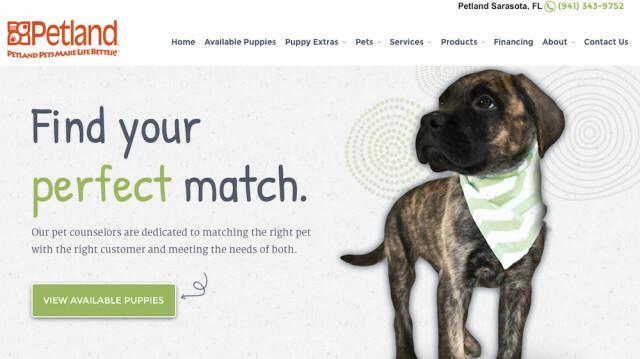 Matthes pointed out that fewer and fewer stores across the country are selling pets; yet, they are having no trouble sustaining their businesses. They recognize the value, he said, in allowing nonprofit organizations to serve as the sources for people interested in adopting animals. Matthes told the News Leader that animals offered for sale in stores “typically are not in good health,” a fact that often leads to buyers taking them to the county’s Animal Services facility because they no longer want the puppies or kittens. Taxpayers have to pick up the expense, he pointed out, as county staff cares for those animals with the hope of finding them new homes — if the dogs and cats do not first succumb to illnesses they had when they arrived at the stores. Petland Sarasota has this banner on its website. During discussion at the Sept. 21, 2015 public hearing, Commissioner Christine Robinson voiced concerns that reputable breeders would be unable to sell young animals to customers at businesses the breeders own, such as grooming facilities. That led her to cast the solitary “No” vote as the board agreed to advertise the public hearing for Jan. 27. She told her colleagues she would prefer not to have to rewrite the ordinance during that session. Instead, she said she felt revisions needed to be complete before the item came up for another discussion. Assistant County Attorney David Pearce cautioned the commissioners that allowing one set of business people to sell pets but not another group could lead to a legal challenge, if such language were approved in the new ordinance. He cited the Commerce Clause of the U.S. Constitution as the basis for his concern. A News Leader review of the latest proposed ordinance found, under the heading of “Definitions,” the following language: “Hobby Breeder means a person who does not mass produce animals, selectively breeds purebred Dogs and/or Cats for the primary purpose of exhibition or improvement of a specific breed, carefully selects the future owner of their Dogs and/or Cats, and raises Dogs and/or Cats in a humane manner …” Among criteria for raising the animals “in a humane manner” are a demonstration that the dogs and/or cats are being reared on a person’s property; the sale or transfer of the animals “directly to individual pet owners or another Hobby Breeder” and making certain that the person has no more “than four breeding females,” the document points out. Last fall, several weeks after the September public hearing, Robinson told her fellow board members during the Reports section of a meeting that she was getting numerous emails from breeders who were worried about the ordinance preventing them from conducting sales transactions at their business locations. Robinson also was the commissioner who asked that the public hearing be the sole item on the Jan. 27 agenda. She said she was basing her request on the length of time the board devoted to the matter at the two previous hearings. 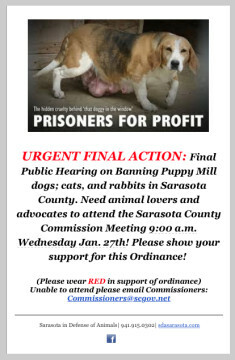 Sarasota in Defense of Animals is asking all supporters of the ban to wear red for the meeting. “There’ll be a good crowd,” Matthes told the News Leader. The organization also has requested that anyone in favor of the proposed ordinance who cannot be present on Jan. 27 email the commissioners ahead of time: commissioners@scgov.net. “I’m looking forward to a favorable decision by the County Commission,” Matthes said.